Social-emotional competency is key to school success, but doesn’t come naturally to a lot of boys. In my book, The Elementary and Middle School Student-Friendly Handbook to Navigating Success, I detail eight strategies students can use to handle stressors and prevent bullying — as well as dozens more tips students can use to increase school success. Strategy #1: If you are having a bad day, inform your teacher(s) at the beginning of the class. Why: Your teacher will be aware of your mood and can support you with having a better day. Helpful Reminder: You can also let the lunchtime/recess staff know. Despite the type of day you are having, you are still expected to follow the classroom and school rules. If you’re in a bad mood, you should not disrespect your teacher, the staff or the other students. Strategy #2: Whenever you have a problem at school, speak to your teacher first before you discuss it with your parent(s). Why: Speaking to your teacher right away provides you both with an opportunity to solve the problem so that it won’t continue to bother you. Strategy #3: Avoid leaving the classroom without permission. Why: Your teacher is responsible for your safety. If you walk out of your classroom without telling your teacher, you are creating unnecessary stress and damaging your trustworthiness and you could get in trouble. Helpful Reminder: If you feel frustrated or angry and need a quick walk or water break, raise your hand to request it. Strategy #4: If a classmate is bothering you, using a strong voice, tell him or her to stop specifically what he or she is doing. If that student does not listen to your request, let the teacher know. Why: You are standing up for yourself. You have a right to be respected. Telling the teacher is not tattling; it is a technique to resolve a problem after speaking with that particular student. Strategy #5: Avoid teasing and laughing at other students. Why: Teasing and laughing are disrespectful and hurtful, make others feel angry and embarrassed, and create conflict. Why: You are standing up for yourself by speaking. Settling conflicts by speaking does not make you look weak. Resolving an argument or disagreement using words is the most responsible and peaceful approach. You don’t want to physically harm yourself or another student. Strategy #7: Nobody should exclude another student from sitting next to him or her and/or from playing with him or her. Why: It will hurt the feelings of that student. You have an opportunity to make a new friend. Strategy #8: As a bystander, if you witness any student(s) being verbally bullied, physically bullied, or cyber-bullied, immediately report it to an adult. Explain in great detail what happened to that student and where the bullying took place. Why: You will be proud of yourself because you are reporting bullying to protect students. You are taking charge of the situation. Want more? 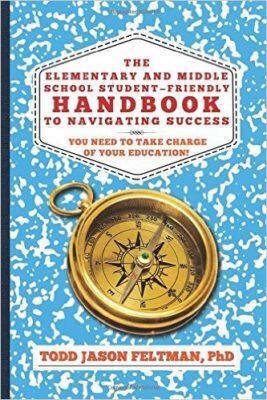 My handbook is geared for students in grades three to eight, teachers and parents, and contains one hundred-ten strategies to help students take charge of their education. Todd Feltman is a second year New York City Department of Education elementary mlschool assistant principal. He has been molding young minds for the last eighteen years in public and independent schools as an assistant teacher, classroom teacher, new teacher mentor, literacy coach, journalism/writing teacher and elementary and middle school literacy achievement coach. Todd earned his doctorate in Urban Education. He has three master’s degrees, which include childhood education, literacy education and school supervision/administration. He is passionate about engaging and supporting boys in reading and writing. Todd has presented multiple workshops to administrators, educators, parents and boys.